How to make your business stand out from your competition? Seth Godin. Name, which should seemingly say something to me. In the last two years it has been jumping to my eyes from everywhere. INC magazine mentioned his blog as one of the most important business blogs of today. His books kept showing up in suggested readings lists I follow. Seemingly many big names of today like Ramit Sethi and several others have worked for him. WOW, I thought. So of course this built high expectations. After some thought, I ended up buying his book, Purple Cow. As I was busy with other things back at the time, I borrowed it to my dad (Master in Marketing, entrepreneur for 20 years, also avid reader of business books). His opinion: “Total waste of time”. What a let down. After now having read the book myself, I understand what he meant. However I don’t completely agree. I think there are several reasons why the book is like it is. So let’s have a bit deeper look into what we are talking about. Traditional mass marketing doesn’t seem to work, what’s up with that? What could you do to make your product stand out in front of others? Book borrows a lot of ideas from other books, especially from Gladwell’s The Tipping Point that I previously reviewed. Godin talks about the problem with effectiveness of mass marketing fading and how it has become important again to do targeted marketing. This is connected with the Law of the Few in the Tipping Point. Gladwell presented an idea that idea reaches larger population through certain individuals. You should not try to reach everyone to make your idea to spread; you would be wasting money. Only target the ones whom can rapidly spread it to others. These ideas are in a sense interesting. However it feels that Purple Cow does not really add anything new to it. It seems to me that it is more like group of blog posts – opinions and discussion about this topic. This is not necessarily bad; my expectations were on too high level. 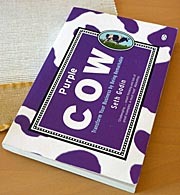 If you have read The Tipping Point and other books about niche marketing, I guess Purple Cow could complement them. It is important to understand that marketing theory was in great uproar in the 90s and in the beginning of this decade. Mass marketing did not work the way it did before and people were not sure why. This book was written (published 2003) during that time, when there was no clear picture of what was going to happen to marketing. Even though the ideas in the book sound familiar and something I have already seen, they were not like that back then. As I was curious about this, I gave the book to my friend who is studying marketing. She actually found the book quite interesting and mentioned that yes; Godin was talking about the future of the marketing in similar ways that they are now learning it in the University today. So in many ways Seth Godin could already before 2003 see glimpse of what the marketing would be like today. Of course in today’s world the ideas he presented are not new, but the reality. In the end I still don’t fully understand what is all the fuss about Seth Godin. Even the book was quite okay when it was published; I doubt the Purple Cow would be enough to make man famous. I hope reading some of his latest work could give me the answer. If anyone else has an opinion about Godin, I would like to hear about it. To conclude, this book might be interesting for you, if you are really into marketing or at least have read some books about it. If not, I would be more cautious. I would at least read The Tipping Point in order to get more out of this one. You very correctly pointed out the single most important thing with Seth Godin – follow him and know where you need to be in the future. He has the amazing ability to pin down new ideas as they are just in the progress of being made. I recommend reading his newest book, “Linchpin”. Thank you for the comment and a book suggestion! I will have to take a look at it when I have some time off from my thesis writing.